I was struck the other day by the relative significance of dates: in part how what may be a very important date for us may be an ordinary day for others, but also how even a day that has attained a solemn timelessness was once just an ordinary day….and may become so once more. All is vanity. This line of thought was raised by looking at some construction photos taken on November 11th, 1915 here in Connecticut, on a somewhat rural but rather important (to the people of Hartford, Ct) construction site. 11-11. A fairly young group of men, many of whom would go elsewhere in about eighteen months time, largely halting construction. Already a great conflagration burned in Europe. But it was not yet a matter of remembrance. And no one knew that it would become something so terrible; there may have been a rumour or two, but nothing to be believed, not yet. It probably wasn’t a topic of great concern at the work site, any more than the wars of today are. 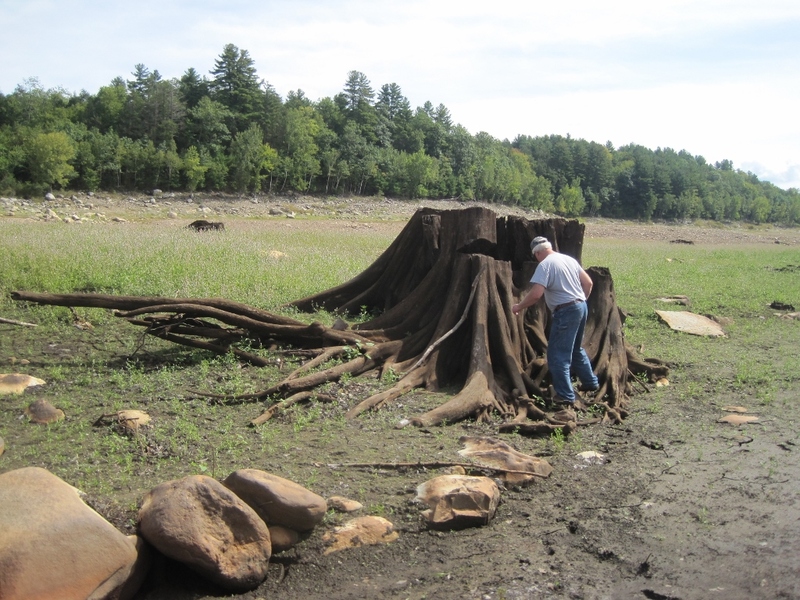 The likely topic was the job for the day and how best to wrap it up to wait out the winter. For me, November 11th is Armistice Day. * It is likely a working day, an ordinary day, but still the grave yawns for me, if only for a glimpse at the strike of 11. For the men in the photograph, Armistice Day wasn’t even an idea. The dates and the monuments of our lives, in their great solemnity, are creations. We remember for a time, but there are few dates that can remain for generations, which is perhaps as it should be. Men lived before us, men will live after us. It is not the dates that remain forever, nor the names, nor yet the places; but the spirit and the life. The hate and the love, the joy and the sorrow. 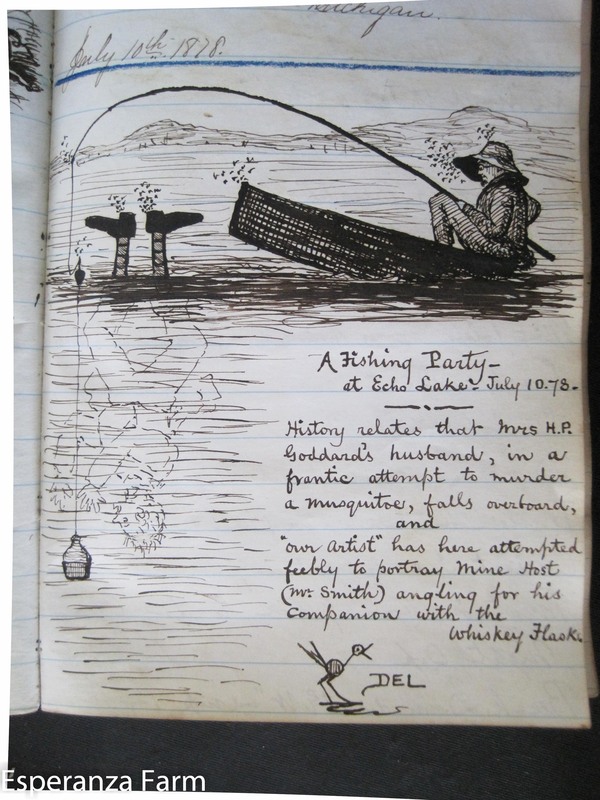 There is one problem with New England summers…as illustrated in the guestbook from 1878! 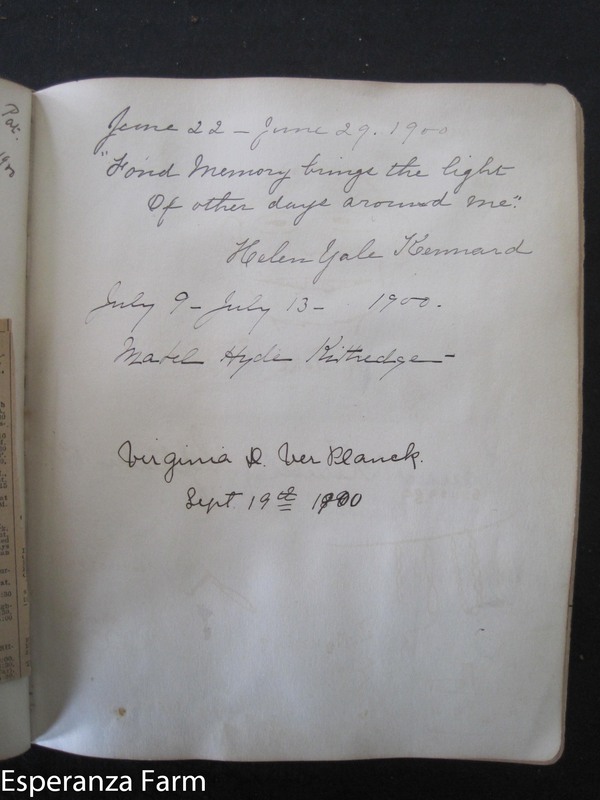 The next visitor on the page was Mabel Hyde Kittredge. She was an author of various housekeeping texts, she was probably a guest of Fannie Smith (who also wrote a book on that theme) rather than WWE, though his knowledge of publishing was likely welcome. She was also one of the founders of the hot school lunch program in NYC, so something of an activist as well. Morris, Julie’s husband, spent most of the winter, and sometimes year, in New Orleans. How did he go back and forth to Hartford? In the early years of the 1840’s and into the 1850’s, he had to take the long route by ship up and around the coast, unless he wished to go by overland stage: uncomfortable and long. He may also have taken a riverboat as far up the Ohio as possible, then connected to overland stage-routes, as his business did have offshoots in the Kentucky/Ohio/Tennessee region. 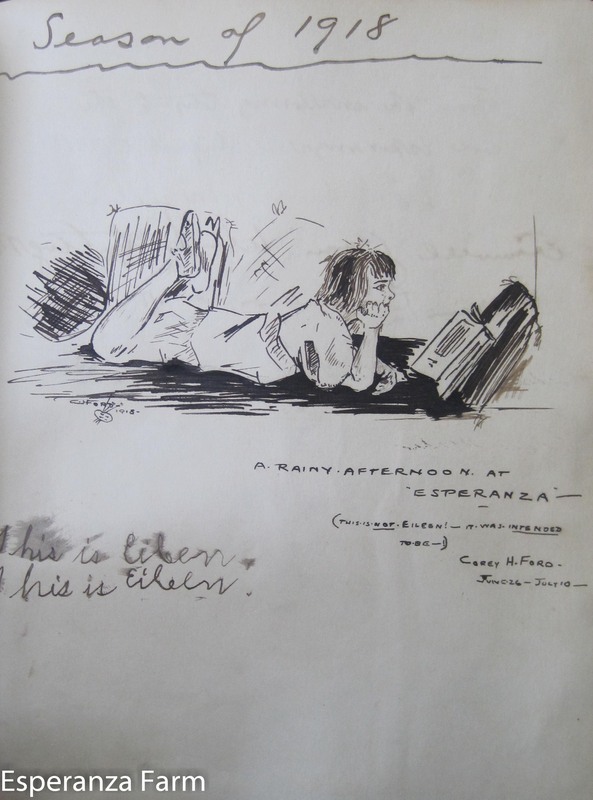 of Esperanza, from 1918. A portrait of Eileen Creevey Hall* partaking of a common activity here. Still common, even if a fair bit of the reading occurs in virtual libraries here and there! I am not sure who Corey Ford was, aside from being confident enough to sketch in the guestbook. I like the sketches, I wish more of the visitors had done so. Eileen and the artist clearly had a difference of opinion on whether it was or was not a portrayal, she was eight at the time.